Twenty-Five Years for Amish Originals! 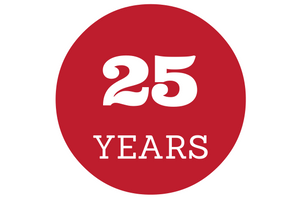 Amazing as it seems to us, 2017 is our 25th Anniversary! Twenty-five years have brought lots of changes for us, but our core principles remain the same. We are proud to be a locally-owned business that sells heirloom-quality furniture made right here in Ohio. Thanks to all the customers who have made this ride so special and keep your eyes peeled for upcoming celebrations throughout the year!